This Mango Dragon Probiotic Smoothie Bowl recipe and post is sponsored by GoodBelly and is an entry in the Reboot Recipe Contest hosted by Go Dairy Free. As always all thought and opinions are my own and I only share brands my family and I know and love. The girls are back at school and while I’m already missing them being home with me I’m excited to get back into routine and they are excited to be back in school. 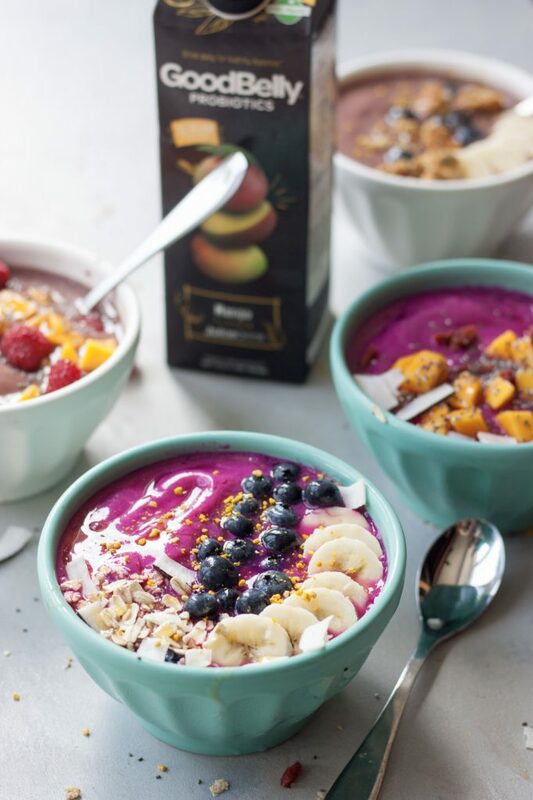 Smoothie bowls are a favorite year round for us, although we do enjoy them more frequently spring thru fall, and a favorite breakfast or after school snack on days the girls have gymnastics, soccer, or dance. They are quick and easy for breakfast and pack in a lot of nutrition, this Mango Dragon Probiotic Smoothie Bowl is no exception! Delicious Mango Dragon Probiotic Smoothie Bowls are easy to make, healthy, and have an added probiotic punch! You’ve heard me talk about probiotics before as they are a big part of our lives and gut health is important to us, especially with some of our tummy troubles. Probiotics help with digestion, immunity, and overall health. Good Belly is a family favorite! The girls fell in love with it (tastes good and makes their tummies happy) a couple years ago during a Good Belly 12-Day Reboot Challenge. It’s been a staple for the whole family ever since. 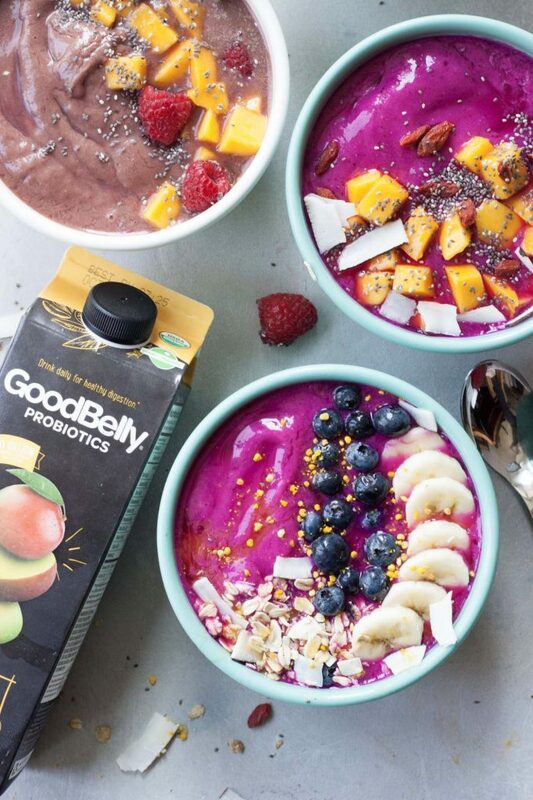 In smoothie bowls, their probiotic shots, and the girls really love the GoodBelly Juice Drinks and they are not usually juice drinkers. The Tropical Green, Mango, and Blueberry Acai being their favorites. It was only fitting that I had the girls help me out when coming up with a smoothie recipe for the Reboot Recipe Contest hosted by Go Dairy Free, also since smoothie bowls are “our thing” we had to go that route. Although a fun layered smoothie that use to be a staple did pop in our minds. serving depending on which one. Your overall wellness will be impacted if your digestion is suffering, so taking probiotics can do more than just help your gut. Did you know 70% of your immune system lives in our gut? Probiotics are a great way to support your immune system. Usually the start of school also means a transition to fall, honestly the apple and pumpkin bug usually bites me in August but didn’t this year or last year. Crazy I know. So this tropical Mango Dragon Probiotic Smoothie Bowl is still a favorite, and I don’t see that changing anytime soon with the girls. The best part is that means I can blend up a big batch in minutes and they can top them with what they want and we have a quick and easy breakfast that makes us all happy, and our bellies! Simple, delicious, and healthy this family favorite Mango Dragon Probiotic Smoothie Bowl is easy to make with only a few ingredients. GoodBelly Mango Juice Drink, frozen pineapple, frozen banana, and frozen pitaya! Option to add in chia seeds for added nutrition (fiber and omegas) and if you want added protein see notes for adding your favorite protein powder. 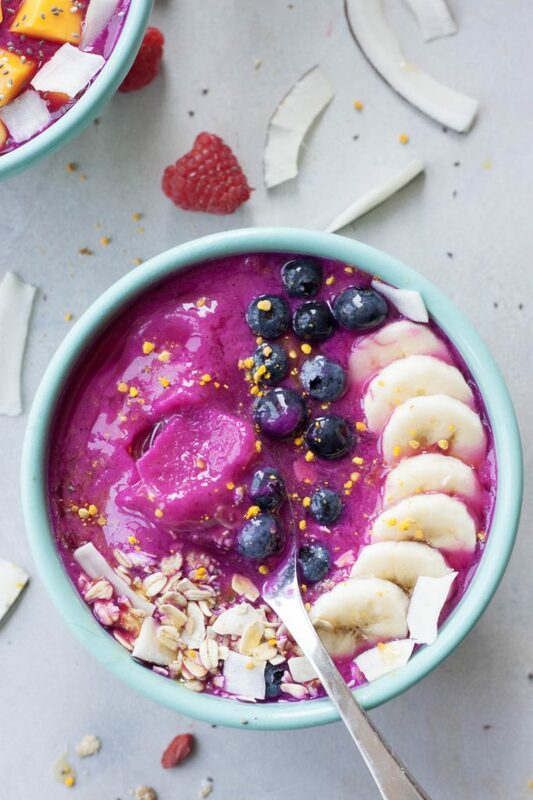 If you don’t have access to pitaya (dragon fruit) or want to switch things up you can substitute acai (shown in photo as the lighter purplish smoothie bowl). If you can’t find either and still want to make it you can use frozen blueberries. If smoothies are your think see notes as you can also make this into a smoothie. Don’t simply trust that probiotics are “good for you”, do your research and experience it for yourself and take the 12 Day GoodBelly Reboot! It’s delicious and easy simply drink GoodBelly for 12days and if you don’t love it, they’ll give you your money back. To sweeten the deal I’m hosting a giveaway over on Instagram where you can win GoodBelly VIP free product coupons. GoodBelly is also giving fans coupons and will be giving away prizes, check them out on social media, during the Reboot campaign (which runs from September 12, 2017 to September 23, 2017). Find out more and download a free product coupon at 12 Day GoodBelly Reboot and get started on September 12th! There was a close runner up using the GoodBelly PlusShot that we will share later during the 12 Day GoodBelly Reboot since we’ll be doing it. I’m going to use it as an opportunity to switch things up as I have some fun ways on my list I want to try them, especially some of the newer flavors. If you’re doing the challenge let me know and if you want more inspiration maybe I’ll share how we’re enjoying them daily on Instagram Stories. Quick and easy Mango Dragon Probiotic Smoothie Bowls are not only packed with healthy nutrition, including probiotics, they're fun and delicious! Perfect for breakfast, snack, or dessert there are endless topping options. They are dairy free, gluten free, soy free, and vegan (excluding toppings). In a Vitamix, or high-speed blender, blend GoodBelly juice drink and chia seeds if using together. Add in pineapple, 1/2 a frozen banana (cut into chunks), and pitaya together until smooth using tamper tool as needed. Add in extra banana if needed to desired thickness until smooth. Spoon into a bowl and add toppings of choice, the options are endless. Enjoy! If you don't have, or can't find frozen pitaya you can sub acai. Another option would be to sub frozen blueberries if neither option is available. For a smoothie instead of smoothie bowl add 1/2 cup of coconut milk, or sub fresh banana and/or fresh pineapple in place of frozen fruit, or use less fruit. When adding in chia seeds, protein powder, or any supplements/superfoods I like to add them in with the liquid and blend before adding fruit. This will prevent clumps and give you the best texture. When adding chia seeds to the smoothie bowl I like to use white as it doesn't alter the color as much, it will still be pink but not quite as bright. Soaking the chia seeds for 15-20 minutes in the mango drink is an option or you can just blend them in, either works. If you want to add protein add in 1/2-1 scoop of vanilla or unflavored plant-based protein. Blend with the GoodBelly Juice Drink before adding fruit. If you are making this without a Vitamix, or high-speed blender, a food processor can also be used. The key to getting the thickest creamiest smoothie bowl is balance of frozen fruit and liquid. Make sure frozen fruit is cut into chunks. If your blender isn't as powerful start with less fruit, or if you get to where it is too thick and won't blend slowly add a little liquid just until you have enough to blend it. Making it in a food processor is like making nice cream (banana ice cream). Pulse chopped fruit and then add liquid, I just find it is a little harder to add in protein or other options but they can be added at the end instead and adding a little extra liquid if needed to blend them in. I haven’t put probiotics in my smoothie bowls and now I am wondering why. This one is GORGEOUS! It’s a great time to give it a try! 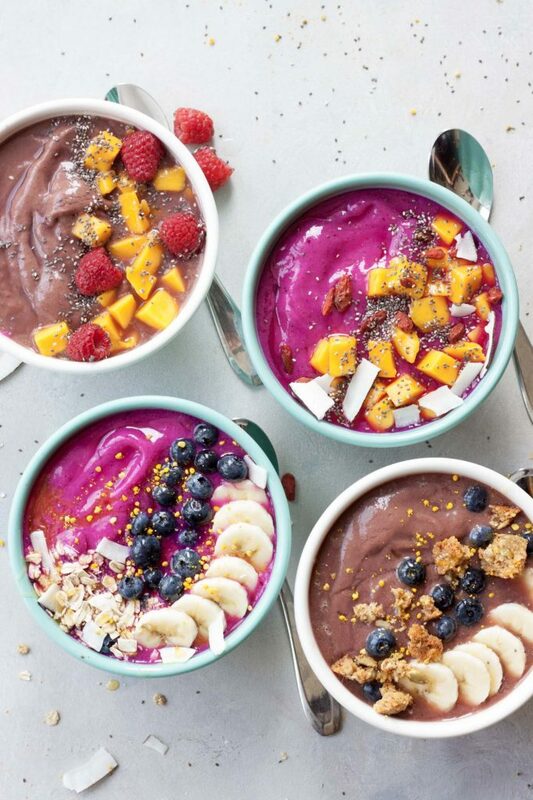 That is one beautiful smoothie bowl! I love the sound of that probiotic mix. I’m always looking for new ways to up my gut goodness..will check it out! Thank you! This is a good way to get in some probiotics! Such a beautiful breakfast bowl! And decorating them with delicious toppings looks like fun! Thank you! We all enjoy topping our bowls with our favorite toppings! There’s a reason you have pitaya! 😉 This will definitely have you back on track and feeling good, hope you enjoy it as much as we do! I’m excited we can get it locally and don’t have to order it or wait until we’re on vacay to enjoy them! GoodBelly rocks! 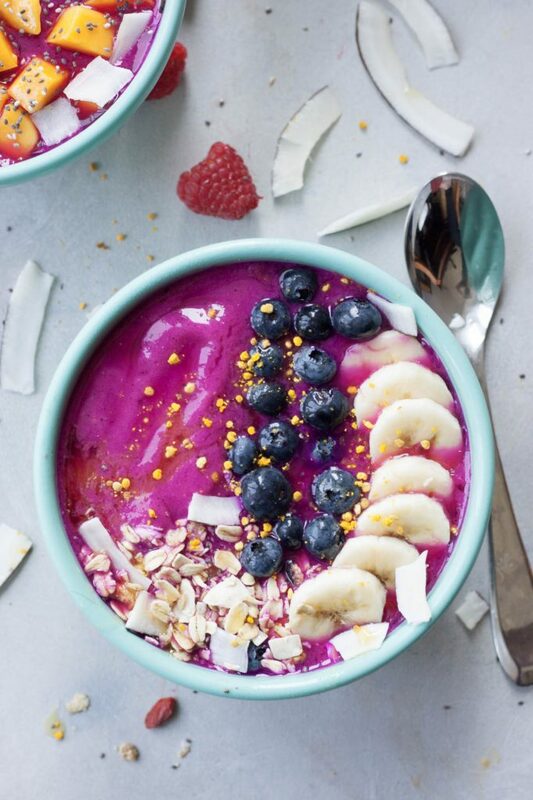 And this is one gorgeous smoothie bowl! It’s the natural color amazing? Can’t help but smile with each spoonful! This sounds amazing! Love the pretty colors. Looks so refreshing! This is so pretty! I would have to make two for me….one to look and while I am devouring the other! Thank you! I can relate, can’t help but smile as I spoon each bite! The color in this is incredible!!! So pretty and delicious. Love the addition of the probiotics. Isn’t the natural color beautiful? I can’t help but smile looking at it! Sorry you are all sick, the doctor would definitely approve of this bowl! Hope you’re all feeling better soon. This is beautiful!!! I STILL have not had a smoothie bowl. This one is selling me. Over the top bursting with color and goodness. Love me a GoodBelly! The StraighShots are my kids’ favorite! Thank you! Really, you’ll have to give one a try! Just like a smoothie but thicker and you get to add toppings and eating it with a spoon is a game changer. 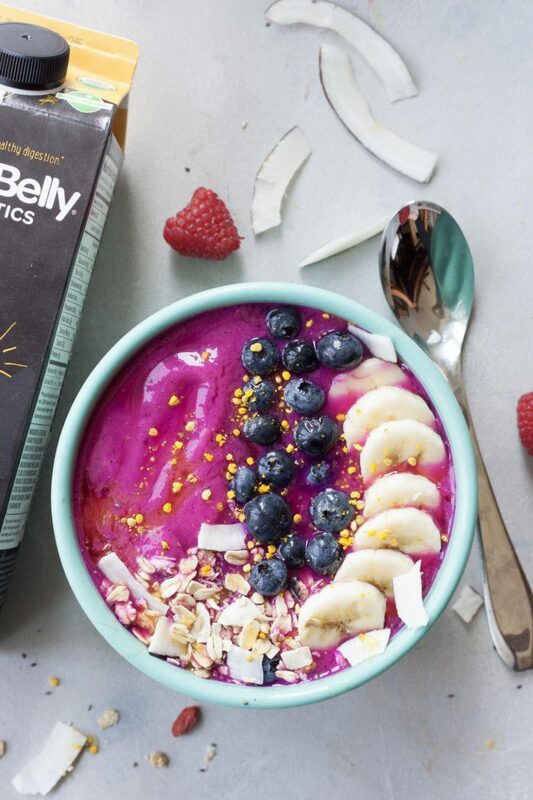 Love GoodBelly too the other smoothie bowl we were going to enter is posting tomorrow and uses one of the shots, I love those too! I am going to try it, looks amazing!